Aug 22 By Jen 13 Comments This post may contain affiliate links. One of my family’s favorite breakfast foods are pancakes. 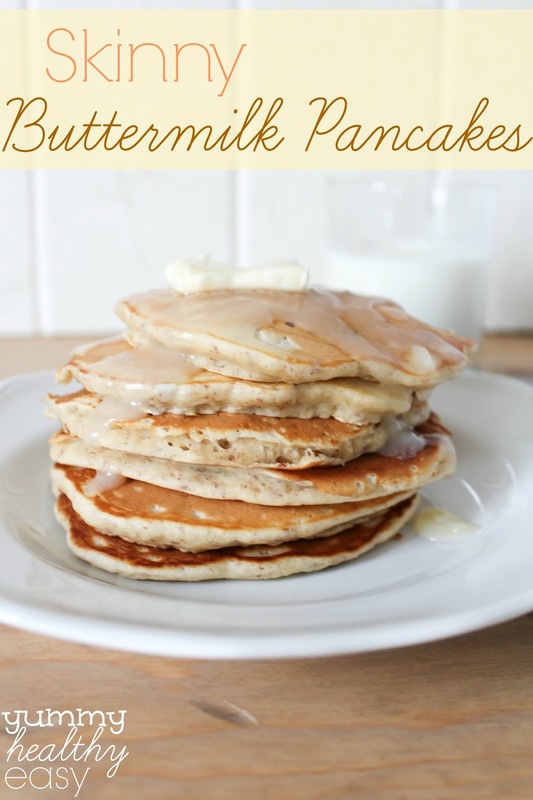 These Skinny Buttermilk Pancakes have flaxseed, low-fat buttermilk and white whole wheat flour. They’re rich, fluffy and have a delicious nutty flavor plus keep you full for hours. 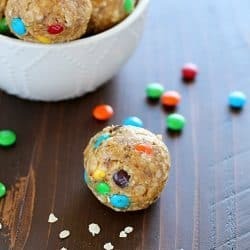 The perfect skinny breakfast treat! T minus 5 days until the big first day of school for my boys. Many of you have kids that have already started their school year but not us over here in Southern California! I am dreading it and looking forward to it all at the same time. I’m ready to have a schedule again. I’m ready to have some peace and quiet during nap time for my two youngest. I’m ready to actually keep some of the food I buy in my cupboard instead of mysteriously disappearing…(pre-teen boys eat a lot!). I’m not ready for the homework, the projects and the many fundraisers that we always have to do. I’m not ready for my two to be in different schools. And I’m not ready to say goodbye to my two older boys all day! 🙁 Waaah. But enough about back to school, let’s talk about pancakes! If I had a dime for all the times I made pancakes this summer, I’d be rich. It’s my boys’ very favorite breakfast. Lucky for me, they’re not picky and will gladly devour the Bisquick kind if I don’t feel like making it homemade. However, those pancake mixes have little to none when it comes to nutrition content. And they’re hungry again in about a half hour. 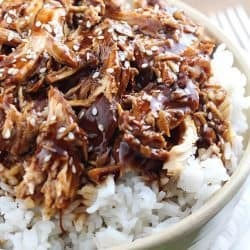 So I’ve been messing around with a few recipes, trying to get one that has a good consistency and flavor but has some sort of health benefit. We’ve loved this one. The pancakes come out fluffy and have a great texture. They also have sort of a nutty, rich flavor from the flax and white whole wheat flour. They are fantastic! I add a few chocolate chips to the batter, which yes, I know, is not very healthy but holy crap they’re good. 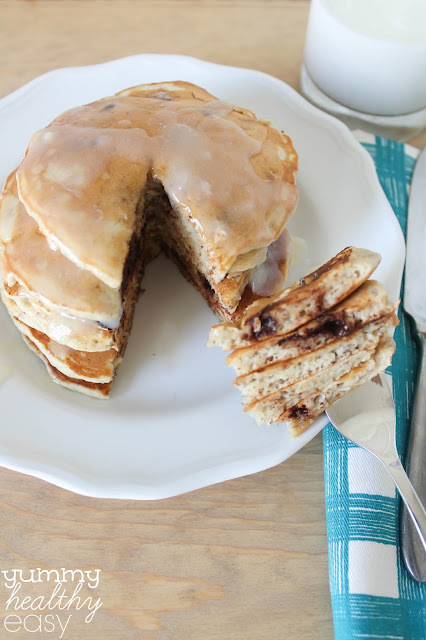 These are pancakes that will fill you up for hours and you won’t regret eating! Pancakes made with flaxseed, low-fat buttermilk and white whole wheat flour. In a large bowl, whisk together flours, flaxseed, sugar, baking powder, baking soda and salt. Add buttermilk, egg and butter and whisk until just moistened (it will have some lumps but don't over mix). If adding fruit or chocolate chips, fold into batter. Spray a large griddle with cooking spray and heat over medium-high heat. In batches, drop batter by 1/4 cupfuls into skillet. Cook until bubbles appear on top. Flip and cook until golden brown. Repeat with remaining batter, wiping skillet clean between every other batch and lowering heat if necessary. 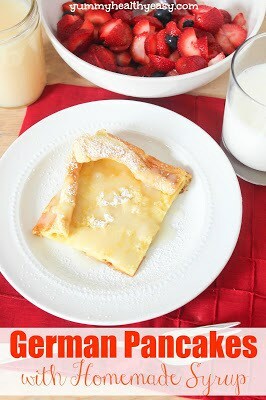 Serve with low-sugar maple syrup and enjoy! *Buttermilk Tip: If you don’t have buttermilk on hand, measure out 1 1/2 cups of low-fat or fat-free milk and add 1 1/2 Tbsp. lemon juice or vinegar and let sit for five minutes to curdle. Use this in place of the buttermilk. I could totally eat that whole stack right now! 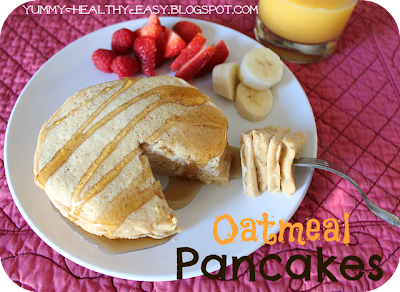 Love how it is a skinny version because I have a weak spot for pancakes! 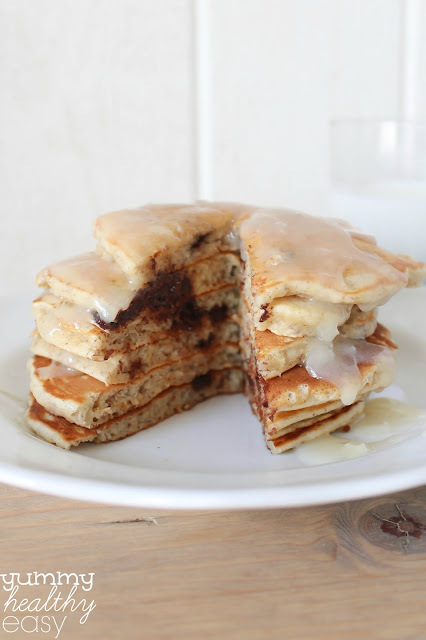 Did you seriously just put Skinny, Buttermilk and pancakes all into one recipe?! I heart you! One of my BIGGEST weaknesses is pancakes. I love them. 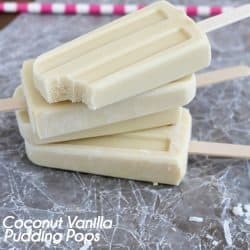 I am trying to do better about watching what I eat so the fact that I can eat these and feel good about it… it’s awesome! Can I ask a dumb question… I have never used Flax seed. Does it have a taste? Does it make things more gritty or anything? I keep seeing recipes with it but I haven’t given it a try yet. I hear you! 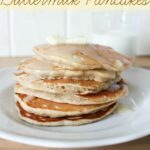 I have such mixed feelings about school starting….of course….I’ll still be home with a 2 year old so not much will change 🙂 These pancakes look awesome and I love that they are skinny! 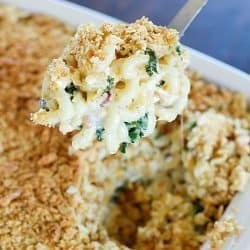 Yum, I just made something similar to this. But then I slathered them in butter, so no more skinny! 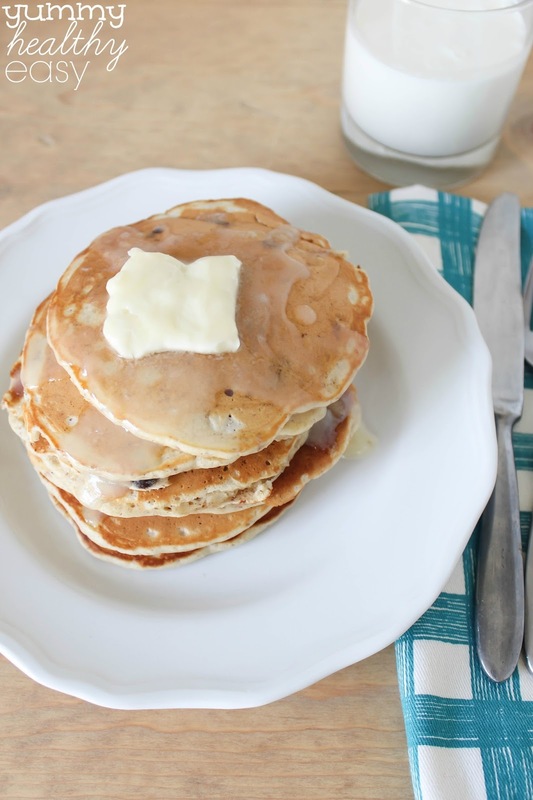 Pancakes are a staple at our house and I am always looking for new recipes! I will have to add this one to the rotation! 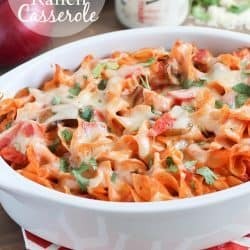 Those look like they have great texture & I love that they are healthy! Thanks for sharing at Sweet & Savory Saturdays #27! I just made these for Shrove Tuesday and they were delicious! Thanks for sharing! I made the pancakes and they were light and fluffy and oooh so good. I want to try and make waffles with the batter and want to know if you have used the batter to make waffles. I hope that they turn out good. I haven’t used the batter to make waffles but I bet it would be awesome! Make sure to grease up the waffle maker really well!